SPRINGFIELD, Ill. (AP) — Six students from Chicago and its suburbs are among more than two dozen whose anti-violence activism has earned them Giffords Courage Fellowships to aid them in organizing anti-violence prevention. TRENTON, N.J. (AP) — New Jersey Gov. Phil Murphy named a long-time state government insider as his gun-safety adviser. The Democratic governor said that Bill Castner will serve as senior adviser on firearms. Murphy made the announcement Monday alongside former NASA astronaut Mark Kelly and one-time Rep. Gabrielle Giffords. Castner is a former chief counsel to former Gov. Jon Corzine and previously served as the top aide to the Democrat-led Assembly. WASHINGTON — A coalition of gun control and progressive millennial outreach groups will be mailing teenagers a present for their 18th birthday: a voter registration form. The coalition is targeting vulnerable pro-gun Republicans in 10 states with the Our Lives, Our Vote drive and hopes to register 50,000 18- and 19-year-olds through the initiative ahead of the 2018 midterm elections. Rep. Ralph Norman said Monday that the reason he pulled out his loaded gun during a meeting with constituents was to prove guns are not the problem in the national debate about mass violence. "The only reason I pulled a gun out, well placed the gun on the table, was to prove the point that the gun doesn't shoot by itself," Mr. Norman, South Carolina Republican, said on Fox News. The husband of former U.S. Rep. Gabrielle Giffords is speaking out against comments made by a South Carolina congressman who pulled out his own loaded handgun at a meeting with constituents, and said he was "not going to be a Gabby Giffords." BOSTON (AP) — New England Patriots owner Robert Kraft is helping students and families of victims of the recent shooting at a Florida high school attend a march against gun violence. WESTFORD -- One week after a shooter killed 17 people at a high school in Florida, 3rd Congressional District candidate Lori Trahan released a searing letter criticizing inaction in Washington and offering a 12-point proposal to reform the nation's gun laws. The Democrat pointed to that plan during an interview with Chelmsford public access television, citing it as an example of her campaign's "creative and innovative" position papers. Debate over gun control may be raging in many parts of the country, but little of it has been heard at New Mexico’s Capitol. The issue barely registered during the legislative session that began a month after a gunman killed two students at a school in Aztec and ended the same week a shooter in Florida killed 17 people at a high school. Gun control of just about any kind has had a tough time at the Legislature in recent years. WASHINGTON - It's been almost six years since Gabrielle Giffords walked the halls of the Capitol, but her time away does not appear to have reduced the number of friends and supporters the former Tucson congresswoman has here. RICHMOND, Va. (AP) — The two major party candidates in Virginia's race for governor sharply disagree when it comes to guns. Republican Ed Gillespie has an A rating from the National Rifle Association. He pledged to "oppose any and all attempts to weaken the Second Amendment." RICHMOND, Va. (AP) — Democratic gubernatorial candidate Ralph Northam has canceled several campaign events following the deadly mass shooting in Las Vegas. BRIDGEWATER, Va. (AP) — Astronaut Mark Kelly will give a lecture at Bridgewater College on how focus, dedication and persistence can lead to success in any competitive setting. Kelly is a retired U.S. Navy captain, a naval aviator and test pilot who flew combat missions during the Gulf War. He flew his first of four missions in 2001 aboard Space Shuttle Endeavor and commanded its final flight in May 2011. A space mission commander and a woman whose career encounter with discrimination led to a national Fair Pay Act are among the speakers IPFW announced for its annual Omnibus Lecture Series. The 23rd season "features four engaging and thought-provoking speakers," IPFW said in a news release. All of the presenters will speak at 7:30 p.m.
Oct. 12 : Capt. Mark Kelly, "Endeavour to Succeed." TUCSON, Ariz. (AP) — Former Arizona Congresswoman Gabrielle Giffords urged people to "fight, fight everyday" against the on-going GOP effort to repeal the Obama-era health care overhaul that she voted for before she was severely injured in a shooting. Giffords appeared at a rally Saturday in Tucson with her husband, astronaut Mark Kelly, and the doctor who cared for her after she was shot in the head in 2011. Tilman Fertitta went all but overboard to salute the commissioning in Galveston of the USS Gabrielle Giffords LCS 10 Littoral Combat Ship and its spunky namesake. Fertitta hosted the Commissioning Chairman's Gala at his San Luis Resort and invited VIPs to a pre-party on his Boardwalk yacht, berthed next to the 422-foot vessel. The warship is named for the former Arizona congresswoman, who was shot in 2011 in Tucson, Arizona, but survived the assassination attempt. WASHINGTON (AP) — The president called on Americans to set aside their differences. One of his fiercest critics prayed for him and the safety of his family. For one afternoon, Washington appeared to be knocked back into a lost era of solidarity in times of trial. Still, it felt naive to think it would last. HOUSTON (AP) — The Navy's newest combat ship was put into active service following a commissioning ceremony Saturday, named after former Arizona congresswoman Gabrielle Giffords who was injured during a 2011 shooting. Giffords told a crowd at the ceremony in the Texas Gulf Coast city of Galveston that she was honored the 421-foot-long ship will carry her name and the vessel is "strong and tough, just like her crew." GALVESTON, Texas (AP) — The 421-foot USS Gabrielle Giffords will be commissioned this weekend in Texas. She pulled into the Galveston pier on Saturday following about a month at sea, after launching from Mobile, Alabama. The Navy's newest littoral combat ship, at 421 feet long, is designed to take on coastal threats like submarines and mines and dominate those waters. Fast. The USS Gabrielle Giffords will be officially commissioned on Saturday at Galveston's Pier 21, honoring the former congresswoman who survived a 2011 assassination attempt. City Councilwoman Helen Gym is the 2017 recipient of the Gabrielle Giffords Rising Star Award, presented by the national political action committee, EMILY&rsquo;s List. Gym, who became the first Asian American woman to serve in City Council when she was elected 15 months ago, was recognized on Monday by the organization, which works to get Democratic women elected to office. PHOENIX (AP) — Former Arizona Congresswoman Gabrielle Giffords will be in Phoenix on Thursday to continue pushing for stronger gun control measures. 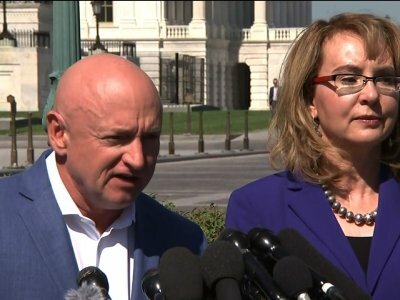 Giffords and her husband, former astronaut Mark Kelly, will join with state leaders to announce a new bipartisan coalition called the Arizona Coalition for Common Sense. The coalition's members include gun owners, veterans, law enforcement officials, domestic violence prevention advocates, educators, faith leaders, and business leaders. 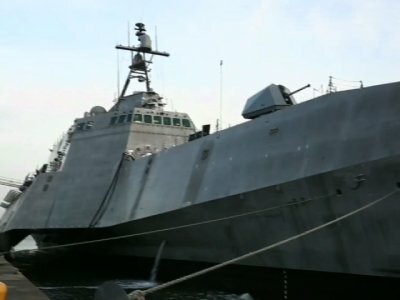 The Navy on Monday announced the commissioning date for one of the few U.S. Navy ships to be named after a woman - this one honoring Gabrielle Giffords, the former Arizona Congresswoman who survived a 2011 assassination attempt. Officials with the Commissioning Committee and the Navy said the Giffords ship will be the third current Navy ship named after a living person. WASHINGTON (AP) — Former Rep. Gabrielle Giffords, who survived an assassination attempt, urged members of Congress to "have some courage" and face their constituents. Partially paralyzed and speaking in just a few simple sentences, a former U.S. congresswoman shot in the head six years ago during a rampage that left a half-dozen people dead delivered the most high-profile endorsement yet of two gun control bills being considered in the New Mexico Legislature. SANTA FE, N.M. (AP) — Former Congresswoman and mass shooting survivor Gabrielle Giffords and her national advocacy group for gun safety stepped into a tense debate Wednesday at the New Mexico Legislature about proposals to expand background checks on nearly all commercial firearms transactions and to restrict access to guns temporarily in domestic violence situations. PHOENIX (AP) — The top federal prosecutor for Arizona is stepping down with the change of administrations in Washington. Attorney General Loretta Lynch on Friday announced the departure of U.S. Attorney John Leonardo, whom she said has served with integrity and distinction while working tirelessly to uphold the law and defend the nation's values. Leonardo is a former Pima County Superior Court judge who has served as Arizona's U.S. attorney since 2012. TUCSON, Ariz. (AP) — Bell ringing and a human embrace event Sunday marked the solemn six-year anniversary of the mass shooting in Tucson that left six people dead and 13 others wounded, including former U.S. Congresswoman Gabrielle Giffords. Giffords was the target at the meet-and-greet event with constituents outside a supermarket and was gravely wounded after being shot in the head. On this date in 1774, Juan Bautista de Anza and Fr. Francisco Garces set out from Tubac with a party of 34 men to establish a route to California. They traveled to Monterey by way of El Camino del Diablo and returned by the Gila River. On this date in 1906, the Arizona Supreme Court judges wore black robes for the first time. On this date in 1929, the Lee's Ferry Bridge was opened across the Colorado River at Marble Canyon. MOBILE, Ala. (AP) — A naval program that has become a target for critics is preparing to commission the USS Gabrielle Giffords, named for the U.S. politician who survived an assassination attempt in 2011. The USS Gabrielle Giffords, constructed by Austal USA in Mobile, Alabama, has completed testing in the Gulf of Mexico and is scheduled to be commissioned in mid-2017. The company handed over the $475 million ship to the Navy on Friday. TUCSON, Ariz. (AP) — A bipartisan group of former lawmakers, ex-Cabinet members and others says Congress and President-elect Donald Trump should lead with civility and respect so the country can move beyond the bitterness of the recent election. PHOENIX (AP) — GOP U.S. Rep. Martha McSally won a second term Tuesday in her Tucson-area swing district as Democrat Tom O'Halleran claimed an open seat to keep it in his party's hands. McSally, a retired Air Force pilot, retained the 2nd Congressional District two years after she barely beat incumbent Democratic Rep. Ron Barber for the seat once held by Gabrielle Giffords. POTOMAC FALLS, Va. (AP) — Former Arizona congresswoman Gabrielle Giffords has brought her push for gun-control laws to the nation's capital and a competitive northern Virginia congressional district. Giffords joined Democratic candidate LuAnn Bennett for a forum on preventing gun violence on Thursday morning. Bennett is challenging Republican Rep. Barbara Comstock in Virginia's 10th District. Navy Secretary Ray Mabus has raised a few eyebrows with some of the names he has picked for naval ships. Why, critics questioned, would he name a ship in honor of the late gay rights leader Harvey Milk or after former U.S. Rep. Gabrielle Giffords when there are plenty of military heroes to choose from? Sen. Pat Toomey, one of the Democrats' top targets in their quest to retake control of the U.S. Senate, is getting support from some unlikely places for a Republican: pro-gun control groups. Americans for Responsible Solutions, a group co-founded by former Rep. Gabrielle Giffords, has thrown its support behind Mr. Toomey, Pennsylvania Republican, as well as GOP Sen. Mark Kirk of Illinois, who is also in a tough re-election fight. WASHINGTON (AP) — President Barack Obama celebrated 50 years of diplomatic relations with Singapore with a state dinner for a leader Obama praised as respected around the world and a trusted partner. WASHINGTON (AP) — President Barack Obama celebrated 50 years of diplomatic relations with Singapore Tuesday with a state dinner for a leader Obama praised as respected around the world and a trusted partner.